As the sun goes down each night, flying foxes leave their colonies in search of food. During their night shift, these keystone species will perform crucial pollination and seed dispersal in rainforests and dry savannahs. Back at the colony during the day, they sleep, groom themselves, mate, socialise and squabble. Males guard their territories, females raise their babies and the young learn battiquette. Interactions are complex and fascinating. Colonies are composed of several hundreds to several hundreds of thousands of animals. Colony sites are occupied all year round or seasonally, depending on the availability of fruiting and flowering trees within flying distance. Many are located near residential areas – either because the suburbs have expanded towards the bats or because the bats have moved closer to towns in search of reliable food (produced by well irrigated garden trees). Destruction of colony sites and food forests by cyclones and/or land clearing have also forced some colonies to find new sites. Flying fox colonies are generally unpopular with nearby residents. Flying foxes can be noisy (especially when disturbed), smelly (especially the males during the mating season) and they do defecate from great heights. Increasingly, residents are fearful of the health risk caused by viruses. This fear has been amplified by the media and by politicians keen for popular votes. Numerous public statements by health authorities that there is no risk provided the animals are not handled are ignored – and even then, the risk is minimal with lyssavirus found in less than 1% of wild flying foxes. The Newman government has been quick to respond to public anxiety by announcing that it will soon facilitate the removal of problem colonies in urban areas by allowing councils to do so without the need for a damage mitigation permit. It is unclear what measures will be in place to control how, when and on what grounds relocations will be allowed. What is certain is that most councils do not have much expertise about flying fox ecology and behaviour. 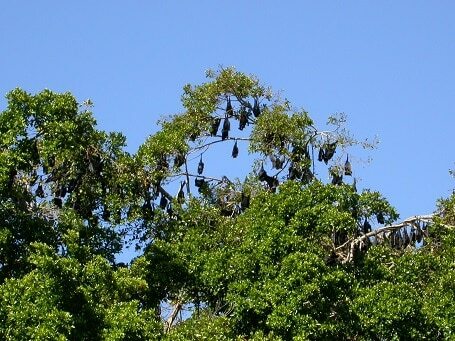 This is likely to lead to poor outcomes for residents and flying foxes alike. Relocating colonies is a costly and difficult process which involves harassing the animals until they move on. It is stressful for the bats and often unsuccessful. Moreover, it is unpleasant for residents, given the use of loud noises and smoke before dawn sometimes for months on end. Depending on the colony and the nearby residents, alternatives to relocating colonies include the following: educating the public about the lack of risk and the great ecological value of flying foxes; encouraging residents to leave the bats alone to avoid stress and noise; installing double glazing windows and building covered walkways to reduce noise and mess; using proactive planning to creating buffers between colonies and residents; planting suitable trees away from residential areas to lure the flying foxes away (a long term strategy); and creating ecotourism ventures (e.g. colony guided tours and observation of fly outs) to demonstrate the tourism value of the animals. The major risk of a permissive approach to colony relocations is that councils are more likely to attempt to relocate colonies as a first instance. This ‘not in my backyard’ approach will result in an endless cycle of cost to rate payers as stressed colonies are moved from one area to the next. 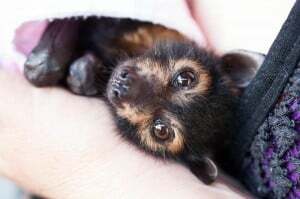 The spectacled flying fox, the main species found in the Cairns and Wet Tropics areas, is listed as a threatened species under the Environment Protection and Biodiversity Conservation Act 1999 (Cth). If we want a better future for these fascinating animals, lets learn to live with them. Harassing them is not the answer.